It is not easy to be far away from people you care about. But flower delivery around Azerbaijan makes the separation less difficult. 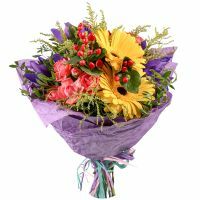 It allows people to express their feelings even over a distance with the help of wonderful gifts – flowers. It doesn’t matter in what city or country you’re right now – just make an order for flower delivery around Azerbaijan online and become closer to the person you care about. How do we help to arrange flower delivery? 1. On the site we present dozens of bouquets and arrangements created by florists for various occasions. Birthday, wedding, professional holiday and even funeral – on our website you will find a bouquet suitable for any occasion. Moreover, here you can order flowers for him and for her, for young and old, for a friend and for someone who is much more than a friend. 2. Our floral arrangements are beautiful and unique, because they are made of first-class plants by experienced florists. Be sure that the flower delivery to Azerbaijan means only fresh and nice bouquets. 3. We ensure comprehensive assistance in choosing flowers by giving you the convenient filters, detailed descriptions and clear pictures – it’s easy to make the best choice according to your requirements and preferences. 4. You’re free to order flower delivery to Azerbaijan any time you want. In addition to our online service we ensure the twenty-four-hour support by the phone. If you have any questions just contact us by Skype, the chat room or the phone as well as via the popular social networks. 5. It’s really fast – just choose a bouquet, fill in delivery details, select one of the payment methods, add billing details and order flower delivery. Within 8 hours the flowers will be delivered to the regional centers and to the other locations they will be brought on the following day after the payment. We practice balanced and transparent pricing. No hidden fees! All prices are indicated in the process of ordering and they are reasonable taking into account the first-class designer products. But the flower delivery in Azerbaijan can be cheaper for you! Use our bonus policies which encourage the regular customers and allow them to collect bonuses with every order. Besides, there are regular special offers allowing you to buy flowers with a discount. Need to congratulate someone in Azerbaijan? Call us and we will arrange a top-level surprise! Manager response: Mate Lisica, thank you. We are very glad that you liked our service. We will wait for your new orders. Have a nice day! Manager response: Thank you, Carol. We really are glad when you stay satisfied. Waiting for future cooperating with you.